Event 1 - See video online here. Who inhabits the city centre/s? / Kdo žije a bydl? v centrech měst? Event 2 - See video online here. Zwei Diskussionen und Filmvorf?hrungen in Berlin und Prag thematisieren die dynamischen Ver?nderungen von St?dten und st?dtischen Lebens seit dem Fall der Berliner Mauer, in einer erweiterten Europ?ischen Perspektive. Wie bedingen sich st?dtebauliche und gesellschaftliche Transformationsprozesse, die sowohl Ausgangspunkt als auch Ergebnis in der Entwicklung der Stadt sind? "25 Jahre. Living in change” hinterfragt insbesondere die Ver?nderungen des Wohnens und Zusammenlebens und deren Auswirkungen auf die Genese der Stadt und die Biografien der Menschen. Am Beispiel von Berlin und Prag diskutieren deutsche und tschechische Akteure aus Zivilgesellschaft, Politik und Stadtplanung mit Blick auf die aktuelle Situation und Perspektive in die Zukunft. Die Diskussionen werden von Filmsequenzen aus deutschen und tschechischen Filmen begleitet. Die Veranstaltungen finden in Prag und Berlin statt, anl?sslich des 25. Jahrestages der Deutschen Einheit und in Bezug auf den 20. Jahrestag der St?dtepartnerschaft Berlin-Prag. Die erste Veranstaltung findet am 02. Oktober in Pag in der Galerie der Tschechischen Zentren statt, die zweite Veranstaltung am 10. November in Berlin im bauhaus re use am Bauhaus-Archiv / Museum f?r Gestaltung. Die Veranstaltungen sind ein Projekt von zukunftsgeraeusche, gef?rdert von der Bundeszentrale f?r Politische Bildung (bpb), in Zusammenarbeit mit dem Berliner Senat, den Tschechische Zentren Prag, dem Prager Magistrat, Institut f?r Stadtplanung und Stadtentwicklung (IPR), dem CVC Education Center Prag und dem Bauhaus-Archiv / Museum f?r Gestaltung Berlin. Two discussions and screenings in Prague and Berlin address the dynamic changes of cities and urban living since the fall of the Berlin Wall, in an enlarged European perspective. What are the corresponding civil society processes and transformations, both initials and results within the development of the city? „25 Years. 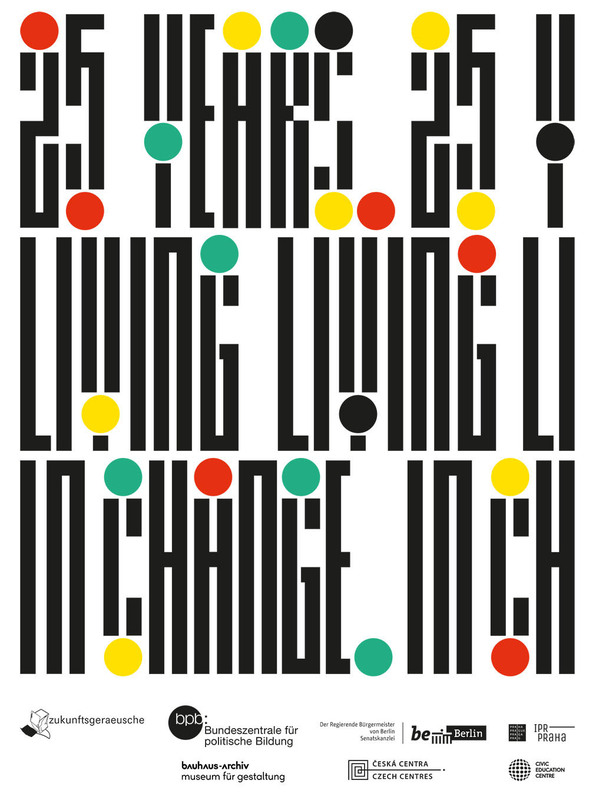 Living in Change“ questions in particular the changes in housing and ways of living together and their impact on the cities genesis and people’s biographies. On the example of Prague and Berlin both Czech and German civil society actors, politicians and urban planners will share their view on current situation and the prospect for the future. The evening will be accompanied by film sequences from German and Czech film narratives. The first event in Prague takes place on 02.10.2015 form 8pm, the second in Berlin on 10.11.2015 from 7pm in bauhaus re use. The project “25 Years. Living in Change” is organized on the occasion of the 25th Anniversary of the German Reunification and in relation to the 20th Anniversary of the City Partnership Prague-Berlin by zukunftsgeraeusche and is supported by the German Federal Agency for Citizenship Education (bpb), in cooperation with the Senate of Berlin, Czech Centres, Prague Institute of Planning and Development, Civic Education Centre Prague and Bauhaus-Archiv / Museum f?r Gestaltung Berlin. Dvě diskuse a prom?t?n? v Praze a Berl?ně se zaměřuj? na dynamick? změny měst a života ve městech od p?du Berl?nsk? zdi, v rozš?řen? Evropsk? perspektivě. Jak ovlivňuj? procesy a transformace občansk? společnosti – jejich vznik a v?sledky, v?voj ve městech? “25 let. Život v proměn?ch” tematizuje předevš?m proměny bydlen? a jejich dopad na genezi měst a biografie jednotlivců. Na př?kladech Prahy a Berl?na budou němečt? a češt? akt?ři občansk? společnosti, politici a architekti diskutovat vlastn? pohled na současnost a v?hledy do budoucna. Večer budou doprov?zet kr?tk? uk?zky z česk?ch a německ?ch filmov?ch př?běhů. Diskuse v Praze proběhne 2.10.2015, v Berl?ně 10.11.2015 od 19 hod. v bauhaus re use. Projekt “25 let. Život v proměn?ch” se kon? u př?ležitosti 25. v?roč? německ?ho sjednocen? a z?roveň 20. v?roč? Partnerstv? měst Praha a Berl?n. Organiz?torem je zukunftsgeraeusche, podpořila jej Bundeszentrale f?r politische Bildung (bpb). Partneři: Sen?t města Berl?n, Česk? centra, Insitut pl?nov?n? a rozvoje hl. m. Prahy, Centrum Občansk?ho Vzděl?v?n? Praha, Bauhaus-Archiv / Museum f?r Gestaltung Berlin. Who inhabits the city centre/s? Prague is known to be the Golden heart of Europe, while it`s own center is getting more and more exclusive. Berlin in return for having many centers, including the former split between east and west. How have the Prague and Berlin centers developed in the last 25 years? What are the significant changes? The discussion is leading the critical view on how the city centers are actually inhabited. Is life and creativity taking place in the centre in Prague or rather on the outskirts? The event is accompanied by a curated selection of film-clips from famous Czech and German films. It is held in English and available online here. Before and after the fall of the Berlin Wall and today, 25 years later, new housing concepts are facing the demands in contemporary housing. But how have ideas and goals changed and how do past and present utopias cope with the challenges of individual, sustainable and user-oriented housing? The discussion deals with Berlin and Prague as two cities whose residents over the past 25 years experienced a variety of changes in living, housing and urban redevelopment. Above all, the difficulties of realized concepts, built utopias and the urban redevelopment tell comparable stories of housing that are continued in coping with today’s housing shortage and the progressive transformation of entire urban quarters. Afterwards the recent documentary “Concrete Stories” (Findeisen, 2015) on prefabricated housing estates in France, Germany and Czech Republic will be screened.